There are several distinct lodging areas of Cartagena, Colombia to choose from and they can make a big difference in how you experience this historic port city. One of the best if you want to be on the water, with a big room, is the Intercontinental Cartagena that we reviewed recently. 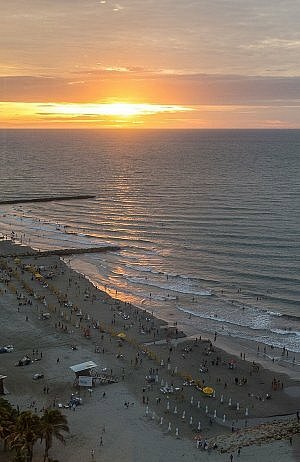 Many foreigners who come to Cartagena are coming for the history, the atmosphere, the architecture, and cobblestone streets. Others don’t need to spend all day and night there though and would rather have a large hotel with an oceanfront view and a pool by the sea. You’re not going to get any of that in the walled city itself, so if you’re in that camp you might want to consider the Intercontinental. This is especially true if you have status with that chain (or the right credit card) that will get you an automatic upgrade. While the standard rooms are a good size, one step up will put you into a living space that’s larger than many of the condos nearby. Executive rooms, Corner Suites, and Junior suites average 960 square feet. Ample desks, large bathrooms with lovely Agraria amenities, robes and slippers, and more than enough space for clothes and personal effects add to the comfort level. Suites also have bathtubs and kitchens. This being part of a big international chain, you’re not going to have a lot of downside surprises and you’ll find conveniences you expect like well-placed gadget charging outlets and a full gym that’s open 24 hours. If you get bumped up to the executive level or pay an extra charge to be there, you get a terrific 15th-floor view of the water while enjoying happy hour drinks at sunset time. Breakfast is served here for guests on the right floors and throughout the day the lounge serves snacks, sodas, coffee, and beer. The large swimming pool running almost the width of the building is a big draw, with rows of lounge chairs and a hot tub at one end. It faces the sea, as does the restaurant behind with indoor and outdoor seating. When you exit the hotel at the ground floor, you’re right on the beach. While these big chains can sometimes come off as being the same from Cleveland to Cairo, this Intercontinental takes a good stab at establishing a sense of place. If any of this sound like standard big box international luxury hotel stuff, know that the InterContinental Cartagena is not as cookie cutter as some. Vibrant art throughout depicting local crafts (bead work, textiles, etc.) and hand carved wooden fishing canoes purchased from area fishermen, cleaned, and displayed around the property channel a bit of Colombian coastal flair. 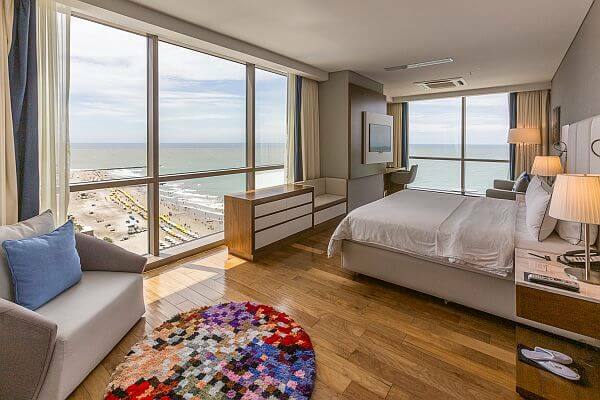 While there aren’t a huge number of Intercontinental hotels in Latin America, the ones you do find are often among the best in the city where they’re located. This one is no exception and is a good compromise between the historic Cartagena boutique hotels right in the center and the newer far-flung Conrad golf resort that can take a half hour to reach. 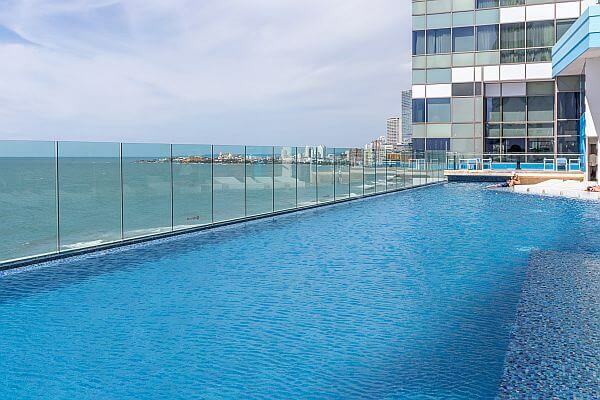 See more photos and our full review of Intercontinental Cartagena Hotel in Colombia.